We have plenty of on-site parking, but if you've already parked for some of the numerous other activities in Portsmouth, we're within easy walking distance of anywhere in the downtown area. 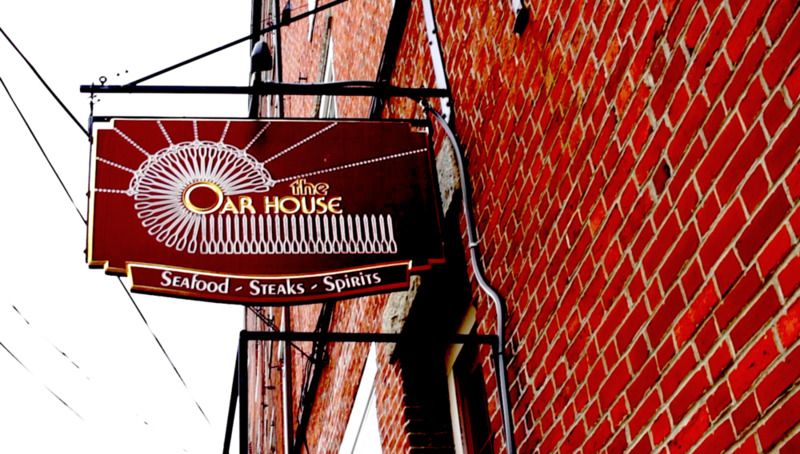 Located in the historic Merchant's Row building at the edge of Portsmouth's old harbor, The Oar House serves fine food in a setting filled with mementos of the city's long and proud maritime heritage. We feature live music inside on Friday and Saturday nights, our waterfront deck is open in summer, and we have on-site parking.Located in the historic Merchant's Row building at the edge of Portsmouth's old harbor, The Oar House serves fine food in a setting filled with mementos of the city's long and proud maritime heritage. The Oar House is located in Portsmouth's Olde Harbour area, which in the late 1700s and early 1800s was a thriving seaport. In December, 1802, 120 buildings burned in Portsmouth's most disastrous fire, including the wooden mercantile structures that occupied the restaurant site. The citizens of Portsmouth rebuilt almost immediately, in the early months of 1803, using brick to eliminate future fire hazards. The buildings on Ceres Street, including the one now occupied by the Oar House, were constructed at this time. Designed as warehouses for grain and molasses, the buildings, which at the time were the tallest buildings in the United States, comprise a row of contiguous brick structures known as "Merchant's Row." In the early 1800s, Market Street, with its elegant homes on one side and Merchant's Row on the other, formed a residential-business complex that was the vital center of this thriving seaport. At the time, the water's edge was directly outside the Ceres Street building wall, and ships unloaded directly into what is now the Oar House dining room and lounge. From there, the goods were raised by elevators to the upper floors. Alexander Ladd, who headed one of the wealthy mercantile families typical of this period, owned the Oar House building. His home overlooking the river, the Moffatt-Ladd House, is now maintained by the Colonial Dames of America, New Hampshire Division. The mansion is open to the public in summer, and is a fine example of days gone by. We urge you to take time for a visit. Suggested but never proven is a story that Ladd's warehouse on the water and his residence were linked by a tunnel under Market Street, which allegedly caved in many years ago and was sealed. During the initial renovation of the Oar House, a spring-fed well was revealed at the rear of our downstairs dining room. The well served the early needs of the building and opened to the street above in case of fire. Because of Portsmouth's protected and deep harbor, the city was the scene of many shipbuilding enterprises. This activity reached a peak between 1840 and 1860 when 169 vessels were built. Of this number, 54 were barks, brigs or schooners, and 115 were three-masted sailing ships, including 28 clipper ships. The artwork hanging throughout the restaurant outlines the history of some of the more prominent ships, and the models are all of Portsmouth-built vessels. At the Oar House, we have tried to honor the marine heritage of Portsmouth in its heyday of commerce on the sea. As a museum restaurant, we hope you enjoy our menu and our displays.